Shelling them. Thankfully, we had plenty to listen to. Or rather, the kids did. They were very willing to shell peas while they listened to the Little House Series . They adore those books, and plus shelling peas feels like something Laura and Mary did. Shelling the 10 pounds of peas took hours, they finished off one of the books and got about half way through another one. But that's the longest part of putting up peas. 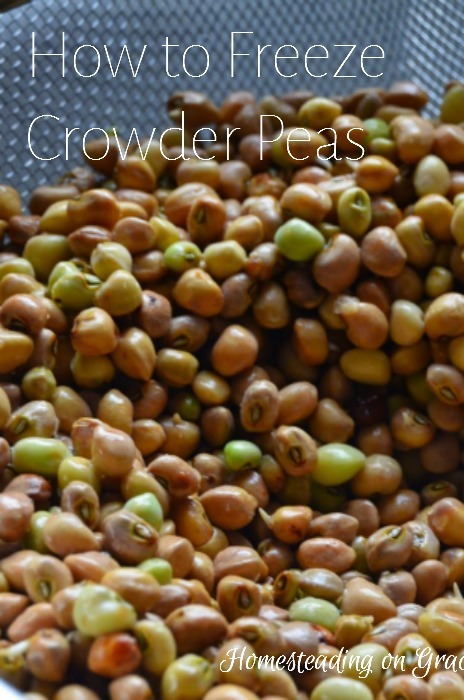 The rest is pretty simple, and even though 10 pounds took hours to shell, it's only about four-quart bags of peas. I think if I were growing peas or beans, which one day I plan on trying, I think I would simply leave them on the bush/vine until they dried. 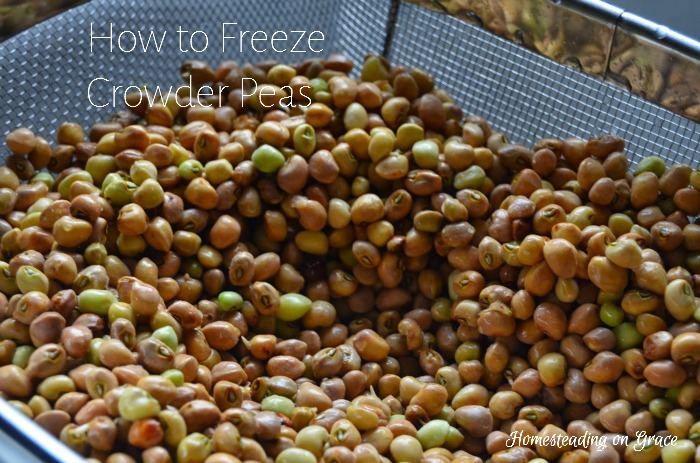 It's easy to shell dry peas, and then you don't have anything else to do. Anyway, after the shelling was done, comes the quick part. We rinsed them, very well, in a colander over the sink. Grandma said to blanch them for 2-3 minutes. So that's what we did! Once the water starts boiling, you drop the peas in and start the timer. Try not to stop the boiling, so I broke this batch into two blanchings. After the time is up, I poured the whole pot of water and peas back through a colander. That's easier than trying to scoop all the peas with a slotted spoon. Then the peas go from the colander to ice water. Again through the colander, and then into quart freezer bags. The colander is really what makes peas easy. The shelling is really what makes peas take forever. But 4 quarts of peas in the freezer means four meals for us. Crowder means are great boiled with salt pork and served with cornbread, greens, and some spicy meat (smoked sausage, bacon, etc.). It's one of Jeremy's favorite meals, so he's pretty pleased we have it in the planner.